If you’re a beginner to trout fishing it can be daunting task learning the hundreds of elements of fishing. In this article, I will guide you through the basic trout fishing tips you need to land your first trout. Firstly identify a stocked lake nearby where you live preferably small in size. When you go for our first visit it is always a good idea to talk to the manager/bailiff of the fishery to ask how it is fishing. Remember they will know their fishery the best and will point you the right direction on what flies/bait have been successful in the past few weeks and well as what location of the lake to fish. Before you even start fishing take a minute to look at the water. Is it of good clarity? If not perhaps you should try a brightly coloured fly if you are fly fishing. Are there any fish moving on the surface? Then use a floating line! 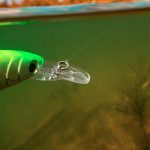 All of these hints can help you decide which tactics you are going to try on your fishing out. Another trout fishing tip I recommend is when getting set up for fishing it is always a good idea to do this well away from the water. If you drop something or are chatting with friends this will not spook the fish. Remember to wet your knots before you tighten them. This will reduce the friction when it is tightened and so reduce the damage to the line making it stronger. So you’re finally ready to start fishing! If you are fly fishing do not worry about casting too far. Surprisingly the fish do come quite near the side where small fish and insects can hide in the bushes. If you have no success with a specific technique after about 30 minutes I would move on to another approach. This could be changing the fly colour, or to another fly altogether. Looking at the water there may be some surface activity in which case you could try a floating line. Of all the trout fishing tips how to cast one of the most important. When your first begin trout fishing the major block is to master the skill of fly casting. In the beginning, it may seem difficult but over time it will become second nature. Firstly I would recommend that if you can afford it you should take professional guidance from an instructor. Bad habits developed early on are difficult to get rid off and may hamper your efforts later on when you want to extend the length of your fly cast. One hour session should get the basics of casting established and you will be able to tackle your first water. To begin with, you should make sure you are holding the rod in the correct manner. Your thumb should be on the top of the rod with the rest of your fingers wrapped around it. Make sure your wrist is fairly relaxed and allow it to move when casting. The first step when casting is to make sure you have about 1.5m of line in the water. This will give your cast the initial weight it needs to get started. You can release more line by moving your rod left to right quite quickly. The surface tension of the water will cause the line to be pulled into the water. The next step is to sharply lift your rod up to about 1 o’clock on the dial of a clock. This is called the ‘back cast’. You should hold the line with the hand that is not holding the rod, keeping a firm grip so no line is released. After a short pause, you should feel the line pulling your rod backwards, at this point flick your rod forwards to 11 o’clock. This is the ‘forwards cast’ and you should let the line release from your hand. When casting you should be using the same sharp action as if you were hammering in a nail with a hammer. Repeat this motion backwards and forwards until you have a decent length of line out. As more and more line is released you will have to pause for longer on the back cast. A common mistake for the beginner angler is to let the rod drop below 11 o’clock on their final forwards cast. This looses the power of the cast and the line will sometimes fall onto the water in spirals. Casting is a technique that can be difficult to master. When you are starting of do not try to match the length of casts you see other experienced anglers make. As you become more experienced you can gradually extend the length of your cast. Congratulations, you’ve managed to cast out your fly and have tricked a trout into taking your fly. One of my top trout fishing tips: You should be watching the water at all times for sudden swirls or a flash of silver. You should particularly watch your line since if you can see it suddenly going straight you’ve got a bite. If you wait until this movement reaches your rod tip, that short span of time could be the difference that is needed for that fish to escape. I remember my first bite when I just a beginner. I was shocked by how violently the fish took the line and started to pull at my rod. The most important step is to quickly and strongly lift the rod up so the rod is at about 11 o’clock on a clock face. This will set the hook in the fish’s mouth. So your fish is hooked now what? You should try to keep the rod up throughout the whole fight since this will keep tension on the line and so tension on the hook. If the fish is on a ‘run’ where it is constantly taking the line just let it do so! If you try to stop it there is a good chance you will snap your line. The clutch on your reel should be exerting some pressure on the fish to slow it down and tire it out. When the fish has stopped running draw some of the line back to keep the pressure up. If the fish starts to dart off in one direction you can control it by moving the rod in the opposite direction. Place your net in the water with the handle near to you. As you guide the fish to the net crouch down so it cannot see and so the fish doesn’t panic. When unhooking the fish wet your hands since your dry fingers can take the protective layer of mucus off the fish’s skin. If you are going to kill the fish do it quickly. You should have an item called a ‘priest’ to dispatch the fish. Hit it hard and quickly overhead in between its eyes. You can check that the fish is dispatched since its gills should not be moving. Although clothing may seem relatively trivial it is something you need to bear in mind when you fishing! In this article, some of my trout fishing tips will concern your safety when fishing while others will make your fishing much more enjoyable. When fly fishing I find it is very helpful to travel light. Therefore I only carry my fishing bag, rod and net. In my fishing bag, I will have a box of flies, sinkant, fly lines and fluorocarbon line. Sometimes I take a camera for records some of the good catches. This relatively light (compared to some coarse fisherman!) setup allows to me cover the whole lake quickly and allows to me change the location I’m fishing quickly as well. 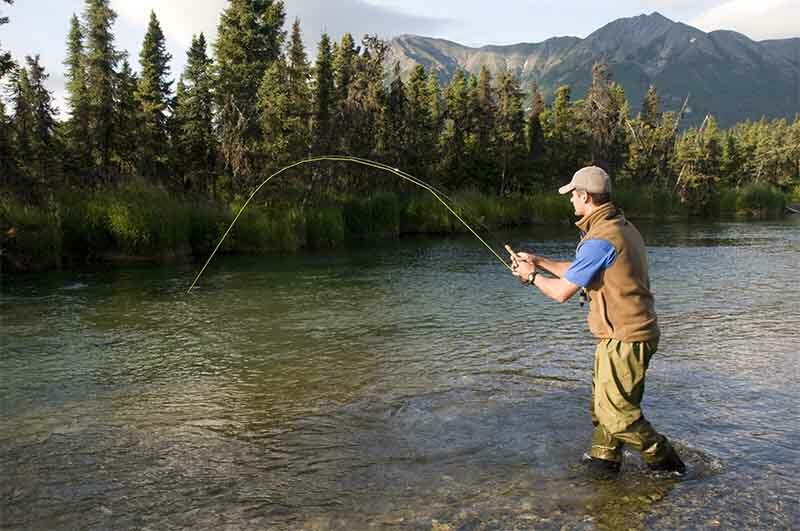 In terms of clothing, the two most important pieces of clothing for a fly fisherman are a hat and glasses. The hat should have a rim on it – this is very important to protect your face from casting, especially on windy days. Similarly, glasses also play a role in protecting your eyes, but if you have polarised glasses they can also help you to spot the fish. Polarised glasses reduce the glare from the water allowing you to see into it more easily. Furthermore, footware is also important when fishing. You want it to be reasonably comfortable since you will be on your feet for long periods of time. However it should also be waterproof for obvious reasons! If you local fishery is quite muddy you may wear wellingtons. I recommend wearing some thick socks which make them much more comfortable. The key to keeping warm outside is wearing layers of clothes. The combination of a thicker coverage of clothing and the insulation quality of the air in between the clothes will allow you to stay warm. In the winter I recommend wearing at least 3 layers on your torso. You can buy special ‘thermal underwear’ which will cover your legs. Finally, I would like to cover the topic of camouflage clothing. While I think it will make a difference if you wear a bright red jacket and green one, the difference between a green jacket and a camouflage one will be very very minimal. Also the added expensive of buying camouflage clothing I do not recommend it.